"I'd rather not talk about how I know that a plane is gonna crash 10 days before it happens." It's always great to see underrated actors enjoy a career renaissance, regardless of the venue. 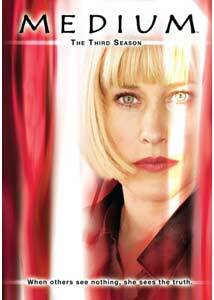 In Patricia Arquette's case, she went from showing up mainly in feature films to starring in the NBC series Medium. What a prime gig it has turned out to be, as Arquette has not only powered the show to multiple seasons, but has picked up an Emmy in the process. With the upcoming fourth season slated to premiere (pending the ongoing writer's strike, of course) early in 2008, Paramount Home Video has made it possible to get caught up on previous episodes with Medium: The Complete Third Season. Allison DuBois (Arquette) continues to live her unique life in Phoenix, Arizona with her husband, Joe (Jake Weber), and three girls Ariel (Sofia Vassilieva), Bridget (Maria Lark), and Marie (Miranda Carabello). While she might seem like your average consultant for D.A. Manuel Devalos (Miguel Sandoval), Allison is actually a psychic, who has the ability to "see" clues she uses to help solve the city's numerous homicides. Along with Devalos, the only other coworker that knows her secret is rugged cop Lee Scanlon (David Cubitt). This unique crime-fighting team tackles cases on a daily basis, but such tasks often can't compare to what Allison has to handle at home, a family of five. Season three begins with Four Dreams, a two-parter that broadens the focus from only Allison's dreams, to those of Devalos, Scanlon, and even Bridget. It seems that the dreams of all involved might be connected to a series of violent home invasions, but Allison is busy dealing with the new appearances of her ex-boyfriend (Thomas Jane), who recently died. This is a great way to kick-start the new season, setting the pace for what turns out to be an amazing set of shows. In Be Kind, Rewind, Allison is living the same day repeatedly, having to keep from being killed in a nasty car crash and avoid a murder that occurs in a restaurant. Blood Relations finds the return of Dr. Walker (Mark Sheppard), who continues to haunt Allison as his present-day descendant is showing similar, murderous tendencies. During Ghost in the Machine, Joe's birthday present, a video camera, turns out to show more than any electronic device should, and in Profiles in Terror, the D.A. 's office if overtaken by a famous FBI profiler (Kurtwood Smith) who doesn't get along with Allison. Mother's Little Helper finds Allison, seeing visions of a recently-murdered mother, receiving some help from Ariel, who is dreaming of her daughter, who just met a similar fate. Next, we get The Whole Truth after Allison and Scanlon look into the murder of a politician, only to be troubled by visions of a young boy trapped in a hole somewhere. Disc 3 starts with Better off Dead, as Allison sees the ghost of a man of left a ton of money to a woman he hardly knew, and continues with Very Merry Maggie, involving a kid obsessed with a creepy old doll. Captain Push (Arliss Howard) returns in Apocalypse, Push, and in The One Behind the Wheel, Allison wakes up believing she is someone named Sandra, while Joe has no idea what to do with his "new wife." The first episode on Disc 4, Second Opinion, is a truly creepy affair, as Allison's dreams of the future involve her daughter, Marie, suffering from Leukemia. We Had a Dream brings someone else into Allison's dreams; a someone who wants to see this particular dream, of a plane crashing into a prison, come to fruition. In The Boy Next Door, we see Allison as a teenager, but during the spooky Whatever Possessed You, her dreams lead her to a girl who might be overtaken by a demon. Jake Weber gets a rare spotlight episode in Joe Day Afternoon. A scorned former coworker of his returns to the office and holds everyone there hostage, while Allison and Ariel are dreaming of the worst possible fate for Joe. 1-900-LUCKY features the return of Allison's brother, Michael (Ryan Hurst), who is in over his head with a money-making scheme. Another great guest star, Neve Campbell, shows up in Head Games and Heads Will Roll as Debra, who might be the target of a suspected killer (Jason Priestly). The season finale, Everything Comes to a Head, finds the killer claiming another couple of victims, while Allison's psychic secret is exposed to the outside world. Season three of Medium is more of the same psychic crime-solving that fans lap up on a weekly basis. Still, Arquette and company somehow find to keep things fresh week-in and week-out, despite the formulaic nature of this sort of drama series. Nowhere is this amazingly fresh approach more apparent than in this set of 21 episodes. Image Transfer Review: Presented in their original 1.85:1 anamorphic widescreen aspect ratios, all 21 episodes look fantastic. Things look as close to the original HDTV broadcasts as possible, as images are sharp and feature a great deal of detail. The color palette is rich and full of vibrant hues, which are complimented by well-handled shadow and contrast levels. Print flaws are virtually nonexistent, with only a couple instances of dirt and grain showing up. Audio Transfer Review: The shows are heard in their original Dolby Digital 5.1 audio mixes as well, with nice surround usage and a wide dynamic range. Some of the tenser sequences benefit greatly from great directional effects, and there's even some bass to add to the impact. Dialogue is always crisp and easy to understand, blending in well with the rest of the mix. 3 Feature/Episode commentaries by 1. Four Dreams (Part 1) - Glenn Gordon Caron, Larry Teng.2. Four Dreams (Part 2) - Aaron Lipstadt, and Javier Grillo-Marxuach.3. Whatever Possessed You - Miguel Sandoval and Jessica Kender. Extras Review: A nice set of extras includes audio commentary tracks on select episodes. The commentary on Four Dreams (Part 1) features Glenn Gordon Caron and Larry Teng who go into great detail about the show, focusing quite a bit on the overall story. Four Dreams (Part 2) has Aaron Lipstadt and Javier Grillo-Marxuach discussing more in-depth, behind the scenes information, while Whatever Possessed You features Miguel Sandoval and Jessica Kender giving a cast-centric perspective on the proceedings. Disc 1 also contains Drawing on Dreams, a seven-minute featurette that focuses on the animation sequences , touching on all of the intricate details that go into such work. This disc also has a pair of deleted scenes for the episode Blood Relations. Disc 2 has only a single deleted scene, and for the episode Profiles in Terror. The third disc has a couple of deleted scenes for the episodes Very Merry Maggie and Apocalypse, Push. Disc 4 contains a single deleted scene for each of the following episodes: Second Opinion and The Boy Next Door. Disc 5 has two featurettes, the five-and-a-half-minute Directing with David Arquette and eight-minute Acting is My "Racquet." The first piece focuses on the episode 1-900-LUCKY, which Patricia's brother helmed, and the second has actor Miguel Sandoval talking to us about his penchant for racquet sports. The final disc has the most extras, including The Story of Medium: Season Three. This nearly 20-minute piece is a comprehensive look at the third season, focusing on each character's individual story elements. There's also a seven-minute Gag Reel, and the 25-minute The Making of Medium: Season Three. The focus here is on the special effects and other fantastical elements that go into presenting the supernatural arch of the show. Finishing things up are four deleted scenes for the episode Head Games. Now that we are intimately familiar with the DuBois family, we get to see more of their family dynamics during Medium: The Complete Third Season. Paramount Home Video has done a nice job with the series on DVD so far, and that doesn't change with this third effort. Excellent audio and video presentations are accompanied by a great collection of extras that delve deep into the production of the show.